Blog Why Is Fines Preservation Necessary? Sometimes, it’s the tiniest of details that end up creating the biggest problems. Consider fine particles of dust, for example: if your business is reliant on a gravel road or runway, for instance, those particles and airborne fines can quickly add up to create enormous repercussions for your day-to-day operations. Whether it’s aircraft taking off a runway or commuters taking their daily trip out of town on a gravel road, vehicle traffic kicks up and displaces these fine particles, which hold the road’s surface together and keep the roadbed strong. Without these particles, roads and runways quickly degrade — potholes are formed, and the roads become less and less safe to drive on. What’s more, this dust can cause health issues for commuters, nearby communities, and the surrounding ecosystem. One commonly used method to combat these fugitive fines is regular watering of the road or runway surface. Though this simple approach can keep dust down in the short term, water actually loosens particles from the road, making the problem worse as soon as the surface dries. Watering therefore encourages potholes, washboarding, and rutting, all of which can result in costly damage to aircraft and vehicles. Cheap chemical dust suppressant products don’t harm the structure of the road like watering does, but they tend to treat only the superficial symptoms of a deeper issue: uncontained loose fines. Thankfully, communities and companies in need of stable and dust-free roads or runways have access to a real, long-term solution: a custom-built fines preservation program. Fines preservation is a process that uses specially formulated chemical solutions to bind particulates to a road or runway surface, eliminating loose fines and strengthening the integrity of the surface. Through the binding process, fines preservation keeps fugitive dust from becoming airborne and prevents the need for additional grading and watering — expensive processes that can take your runway or road out of commission for days or weeks. An effective fines preservation program can double the lifecycle of your surface and eliminate dust by 80-95% for up to four years. It can also reduce variability of surface stiffness, which in turn can cut the costs associated with maintenance, repairs, and reconstruction by up to 50%. In many remote communities, gravel runways serve as a main point of access to the outside world, critical for the transit of both people and goods. However, many of these communities do not utilize proper fines preservation, which causes this crucial infrastructure to quickly degrade. This not only costly in and of itself to repair, but a degraded runway can cause expensive damage to airplanes that the runway operator, rather than the airline, is often liable to pay. Communities and operations that opt for short-term methods like watering are likely to find that the degradation of their runway only worsens, and they’ll spend millions of dollars trying to treat the ill effects of their own approach. Rural communities likewise depend on safe gravel roads as an essential part of municipal infrastructure. Without a proper fines preservation program, however, these roads will degrade at an alarming rate. Airborne dust can damage farm equipment and other machinery, create a thick layer of dirt on homes and cars, and even endanger surrounding plant and animal life. 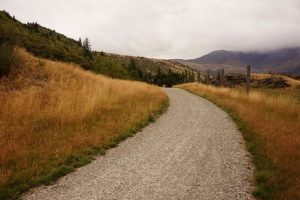 Given the various risks, it’s particularly important that fines stay in place on unpaved municipal roads. At Midwest Industrial Supply, Inc., we tailor each of our fines preservation programs to the unique needs of our clients. Our specially formulated products EK35® and EnviroKleen® use high-tech binding agents to keep fines attached to the surface. This not only reinforces the structural integrity and load-bearing strength of a road or runway, but in doing so, can double the lifespan of that surface. Our solutions eliminate fugitive dust, and cut your need for costly maintenance and reconstruction in half. We can guarantee results because our team of experts works closely with each of our clients to learn everything they can about a site before we get started. Programs are designed based on specific surface requirements, cost considerations, and other variables that may contribute to your fines problem. We also provide detailed application guidelines, and can even offer in-field support during installation. Our comprehensive approach guarantees fines preservation — which means your gravel road or runway can operate in a safe, environmentally friendly, and cost-effective manner. Get in touch with Midwest today, and consider all your loose fines and fugitive dust-related problems solved.